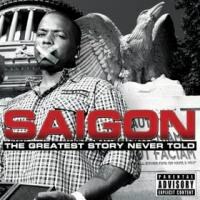 Finally, Saigon's story gets told, thanks to an unlikely partnership with Kottonmouth Kingz' record label. Devin the Dude and Jay-Z guest on an album that sometimes seems like an early contender for rap album of the year. The year is 2007. Papoose and Saigon are two of the hottest new names on the New York radio and mixtape circuit. Saigon in particular is buzzing due to the heavy cosign from Just Blaze, who's branching out from his Roc-A-Fella house work to provide most of the beats for Saigon's debut. HBO's latest hit show Entourage is buzzing and Saigon gets an extended arc as Turtle's first signed artist, Saigon. His album is called The Greatest Story Never Told, and at the time, the title seemed more half-assed than exceptionally appropriate. Over the following four years, Saigon would retire from the industry and unretire in a 48-hour period, dip in and out of social media feuds with Just Blaze and his bosses, cut two well-regarded mixtapes and write and record an album with Statik Selektah in 24 hours. But in all that time, one couldn't help but notice The Greatest Story Never Told was living up to its name. Exceptionally so. In late 2010, the most unlikely of saviors, Kottonmouth Kingz' Suburban Noize label, stepped in as a distributor. In what seemed like some kind of miracle, the album that took Atlantic months and years to unsuccessfully release was in the hands of fans in less than four months. It puts The Greatest Story Never Told in an interesting position. Released with relatively little fanfare, what was once one of the most hyped debuts in hip-hop is now an early-year release dropped under the dark of night on a mostly unsuspecting public. Was it worth the wait? For the most part, yes. The album starts with an unnecessarily unclever skit about the p-i-g-s hosting a party you don't need an invite to. They'll even come pick you up! The party, of course, is in prison, and the only qualification you need for entry is "real niggaism". The actual song based on this analogy, "The Invitation", is more forgiving to the listener's intelligence and doesn't literally spell things out for you. It's really with the "Come on Baby" remix featuring Jay-Z where The Greatest Story Never Told begins. In my mind, there's no doubt Just Blaze's chop of J. Geils Band's "Southside Shuffle" is one of his most hype concoctions. Jay and Saigon trade masterful verses in the old-school New York tradition of making tracks real enough for the heads but heavy enough for the clubs. The song is sort of a swerve, though, because the rest of Saigon's album is strictly on the conscious tip. Lamar Edwards of 1500 or Nothin' stops by to drench Just Blaze's sampledelic "War" skit in synthesizers and possibly corrupt his sound forever (see: Maino, "All the Above"; Eminem, "No Love"; Saigon, "Believe It") before we get launched into the highly nihilistic gut of the record. Here Saigon laments the staggering number of people who've left him for dead on "Bring Me Down, Pt. 2", "Enemies" and the awesome "Friends", crafted from a sample of "Comment" by Charles Wright that bubbles out from under the surface of "Enemies". At one point in "Friends" Saigon mentions being in jail, shortly before transitioning into the title track, which bemoans the numerous social institutions that intentionally and unintentionally keep blacks suppressed in the projects and urban communities. It's one of the first glimpses into the loose conceptual bait of Greatest Story Never Told. Many of the raps here are written from the point of view of a man sitting on his cot, wondering how he ended up locked up and marginalized. "The Greatest Story Never Told" also contains one of my favorite lines of a young 2011: "Turn on a TV, all I see is celebs cakin' it / Feel like they got all the bread but ain't breakin' it / I'm takin' it, soon as I find the oven where they bakin' it!" The title track is really one of the great political thrillers outside of the Roots' last three albums, favorably marrying politics to hot beats and regular hip-hop. Saigon never feels like one of those typical cats, unabashedly and somewhat hypocritically slandering your favorite hobbies and the basics of human nature while finding little time for answers. Unfortunately, while the music that follows this track is pretty uniformly good, it's a lot harder to truly care about compared to the first half. Some of that is owed to the R&B segment immediately following "The Greatest Story Never Told". With their dreamy hooks and 6-minute runtimes, the tracks with Faith Evans and Marsha Ambrosius ("It's Alright", produced by Kanye West) aim for epic social justice but just end up overstaying their welcome and slowing the momentum the album had built to that point. They aren't bad songs. "Clap" in particular is quite good. though definitely three minutes too long. They're just songs that could have used some trimming, or perhaps not been placed so close together. "Believe It" is in this same area and, again, eclipses six minutes. In other words, 20 of this album's 80 minutes are condensed into just three tracks. Perhaps in some other genres this would work, but in hip-hop and this album in particular that kind of time consumption does more harm than good to the flow of the album. What feels at its various segments like a modern classic somewhat sabotages itself, drooping down to Stimulus Package status. Great, but missing that certain dynamic something. In fact, editing mars much of the back half of the album. The features become more prominent, with guys like Devin the Dude, Bun B and Layzie Bone appearing mostly because they've been invited to, and guys like Buckwild, James Poyser and Red Spyda dropping by to assist on the production. While these songs add freshness to the album for those who were bootlegging versions of the album over the past four years, they deviate from the first half's concentrated effort. This second half puts in a lot of work toward making The Greatest Story Never Told feel like one part album, one part collection of tracks recorded in the interim. By the time we hit the bonus track, featuring a typically raucous Black Thought guest verse, the excitement roiling throughout the LP's first half has subsided into a lukewarm collection of decent-to-good tracks. Saigon slips from next best thing to less lyrical Skyzoo. If you're aware of Skyzoo you understand that's by no means an insult, it's just to say that Saigon no longer feels special by the end of this album. But overflowing tracklists aren't new or in any way unfamiliar to hip-hop, so it's not the biggest complaint in the world. After four years trying to release something, an artist might want to cram it with as much content as possible. When the album's protagonist awakes from his dream as a rapper spilling his message live on stage with legend Bun B, he finds himself berated by his correctional officer for being slow to fall in line for lunch. We're not left with the emotional impact I feel Saigon desired, but we are left with supreme evidence Atlantic should have put this album out years ago. I never thought I'd utter these words, but thank you Kottonmouth Kingz. You guys are the best.